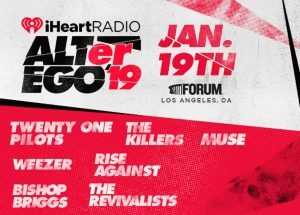 The second annual 2019 iHEARTRADIO ALTer EGO this past SATURDAY (1/19) featured a star-studded lineup from the Alternative format on a rotating stage from 7:30p-midnight at THE FORUM in LOS ANGELES. THE REVIVALISTS hit the stage next and played a five-song set, which included their hit singles “All My Friends” and “Wish I Knew You.” During their set lead singer DAVID SHAW left the stage to serenade and shake hands with fans. KYSR (ALT 98.7)/LOS ANGELES mid-dayer TAMO and PM-driver HARMS teased a surprise to the crowd while introducing RISE AGAINST. The band’s big surprise was RAGE AGAINST THE MACHINE’s TOM MORELLO to perform “How Long.” As TIM MCILRATH sang, MORELLO shred through the track with his guitar – using his teeth at one point for a true rockstar moment. WEEZER fired up the crowd with 30 minutes of hits from the last 25 years, opening with “Undone (The Sweater Song)” and closing with massive cover of TOTO’s “Africa.” Mid-set, WEEZER delivered their current single, “Can’t Knock The Hustle” off their forthcoming 10th album, known as “The Black Album” due out MARCH 1st. MUSE closed out ALTer EGO by starting off their set with their current single “Pressure,” followed by “Psycho,” but one of the highlights of their performance was during fan favorite, “Uprising” – during the song MATT BELLAMY let everyone at THE FORUM sing in unison – a true uprising. The sold-out event was broadcasted live across over 70 Alternative and Rock iHEARTRADIO stations and livestreamed on LIVEXLIVE. Find more highlights here and pictures from our main All Access site, check out: here!